Polyglot is an extensible compiler framework that supports the easy creation of compilers for languages similar to Java, while avoiding code duplication. The Polyglot framework is useful for domain-specific languages, exploration of language design, and for simplified versions of Java for pedagogical use. We have used Polyglot to implement several major and minor modifications to Java; the cost of implementing language extensions scales well with the degree to which the language differs from Java. 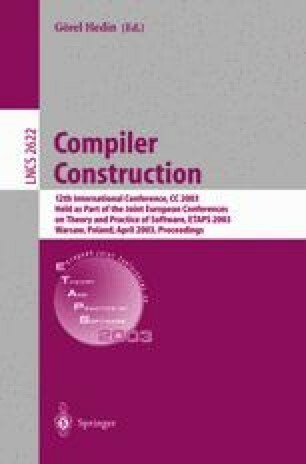 This paper focuses on the design choices in Polyglot that are important for making the framework usable and highly extensible. Polyglot source code is available. This research was supported in part by DARPA Contract F30602-99-1-0533, monitored by USAF Rome Laboratory, in part by ONR Grant N00014-01-1-0968, and in part by NSF awards 0133302 and 0208642. The views herein should not be interpreted as representing the policies or endorsement of NSF, DARPA or AFRL. Scott E. Hudson, Frank Flannery, C. Scott Ananian, Dan Wang, and Andrew Appel. CUP LALR parser generator for Java, 1996. Software release. Located at http://www.cs.princeton.edu/~appel/modern/java/CUP/. Richard Kelsey, William Clinger, and Jonathan Rees (editors). Revised5 report on the algorithmic language Scheme. ACM SIGPLAN Notices, 33(9):26–76, October 1998. Available at http://www.schemers.org/Documents/Standards/R5RS. Richard Snodgrass. The Scorpion system, August 1995. Software release. Located at ftp://ftp.cs.arizona.edu/scorpion. Sun Microsystems. Java Language Specification, version 1.0 beta edition, October 1995. Available at ftp://ftp.javasoft.com/docs/javaspec.ps.zip.